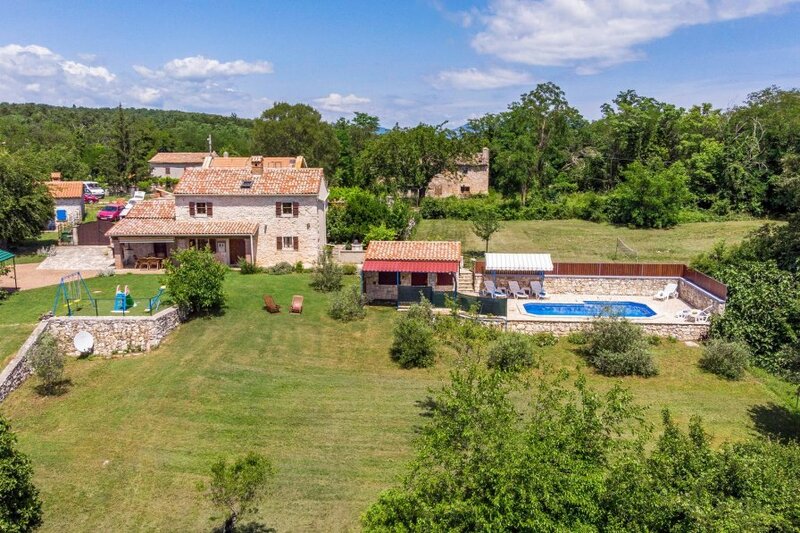 This idyllic holiday home is located in Marceljani, a small place a few kilometres away from Labin. The nicely maintained plot stretches over ca. 1500 sq. m., while at guests’ disposal there is ca. This idyllic holiday home is located in Marceljani, a small place a few kilometres away from Labin. The nicely maintained plot stretches over ca. 1500 sq. m., while at guests’ disposal there is ca. 10.000 sq. m. of the house owner's land. The house is an oasis of peace, where guests can feel nice and enjoy the ambience of untouched nature. 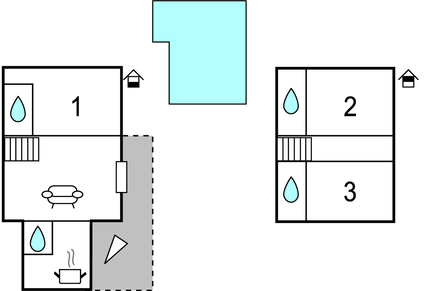 On the ground floor there is a kitchen, living room with fireplace, a toilet and one bedroom with a bathroom. On the upper floor there are two more bedrooms, each with private bathroom. Next to the covered terrace there is a barbeque, while the youngest ones will be happy with a swing, a see-saw and a slide. The swimming pool will offer freshness on hot summer days. The house is positioned on the edge of the village and the closest neighbour is located ca. 10 m away at the back side of the unit. Make sure to visit Rabac and its lovely beaches with crystal clear sea. We also recommend visiting the small town of Labin, well-known as a town of artists with its many art galleries and exhibitions in the open air. This beautiful villa is made from brick or stone and was originally built in 1920 and refurbished in 2011. The agent has rated it as a four star property so it is a well-equipped villa with above average furnishings. It is also great value for money. This villa has a swimming pool and is located in Marceljani, only 5km from Labin. It is set in a good location, 7km away from a stone and pebble beach. There's also a restaurant 4km away.